Clackamas, OR - Warn Industries, the leader in truck and automotive accessories, has taken the air compressor technology found on its award-winning WARN® PowerPlant™ Dual Force and created a full line of stand-alone 12V on-board air compressors. These premium units offer topnotch performance for a variety of uses – from powering air suspension setups and air tools, to airing up tires and inflating camping equipment. Introducing the WARN Air-Power lineup. This line features three premium air compressors: the VTC, SPI, and SPC. Each version has innovative features, outstanding performance, and WARN quality. These units come ready to run out of the box. Simply attach the wiring, connect an air hose, and they’re ready to go. The VTC is the most powerful compressor in the Air-Power lineup. It has a high-horsepower fancooled motor that drives the V-twin compressor. A large one-gallon air reservoir/intercooler not only stores compressed air, but cools it to prolong hose life. All this adds up to an amazing airflow rating of 20 CFM @ 0 PSI and 8 CFM @ 90 PSI, and the ability to air up a 5 gallon tank to 100 PSI in only 50 seconds! The VTC showcases a number of outstanding features including a 100% duty cycle, and an air pressure switch that automatically shuts the motor off when it reaches its maximum pressure of 100 PSI and turns back on when more air is needed. systems for on- and off-road vehicles – the VTC is an on-board air powerhouse. For those looking for big power in a not-so-big package, the Air-Power SPI is a must-have. This workhorse comes with a strong fan-cooled motor and a 1/3-gallon air reservoir/intercooler for storing air and cooler air temperatures for extended air hose life. The SPI produces high airflow ratings of 12 CFM @ 0 PSI and 4 CFM @ 90 PSI, and will fill a 5 gallon tank to 100 PSI in just 90 seconds. Best of all, the SPI is compact enough to be mounted just about anywhere. Like the larger VTC model, the SPI also has a 100% duty cycle and an air pressure switch that shuts the unit off at its maximum air pressure of 100 PSI and turns it back on when more air is required. The Air-Power SPI is great for operating air-suspension systems for on-road and off-road vehicles, powering air tools, and inflating anything that needs air. 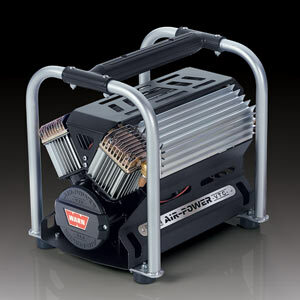 Users wanting a small, ultra-portable, light-duty air compressor will love the Air-Power SPC. Its compact design features an integrated carrying handle, plus it comes with a handy carry bag so it can be taken anywhere. The SPC has air flow ratings of 1.5 CFM @ 0 PSI and 1.0 CFM @ 90 PSI, a 150 PSI maximum pressure rating, and will fill a 5 gallon tank in 5 minutes. 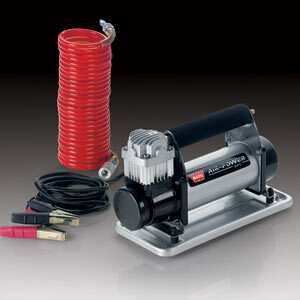 The SPC also features a thermal protection device to prevent the motor from overheating, and it comes with 25’ of coiled nylon air hose and a dual air chuck. Because the SPC is so portable, it’s perfect for airing up camping equipment, such as air mattresses, or to bringing to the racetrack or trail to inflate a vehicle’s tires. The SPC can even be used for air suspension applications. transportation, and it can be removed if desired. The Air-Power SPC has a permanently attached handle and comes with a carry bag for extra portability. Throughout the lineup, the WARN Air-Power compressors are category leaders consistently offering remarkable performance, great styling, and outstanding value. To obtain air compressors with similar performance, consumers would have to spend much more money. And since these are WARN products, they’ll stand the test of time and offer plenty of power for years to come. The Air-Power compressors made their first appearance at the 2007 SEMA Show in Las Vegas in October, and already they’re winning awards. Canadian-based 4WD Magazine and South African 4x4 Off-Road Adventure Magazine both awarded the WARN Air-Power VTC a SEMA International Product Award. 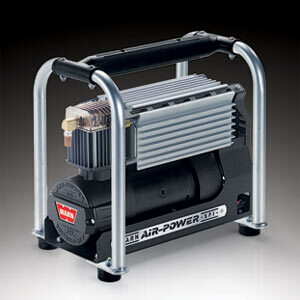 Whether it’s powering an air suspension system on a sport truck, airing up tires on an off-road rig or ATV, or a source to run air tools on a work vehicle, when you need a powerful and versatile on-board air compressor, you need real power: WARN Air-Power. Warn Industries is the world’s most recognized brand in off-road products such as hub locks and vehicle recovery winches. The company designs, manufactures and markets a full line of off-road equipment and accessories that enhance the performance of four-wheel-drive and powersport vehicles. Warn Industries employs more than 600 people in and around Portland, Ore., Livonia, Mich., the Netherlands and Saltillo, Mexico.